Today's map looks at virtual references to the sport of Takraw. For those that aren't familiar with the sport, it is a cross between association football, volleyball and The Matrix. This clip on YouTube gives a good flavour of what the game is like. The sport is extremely popular in Southeast Asia, but within the region there is also much debate about the sport's origins. We therefore decided to explore virtual references to the term indexed by Google. 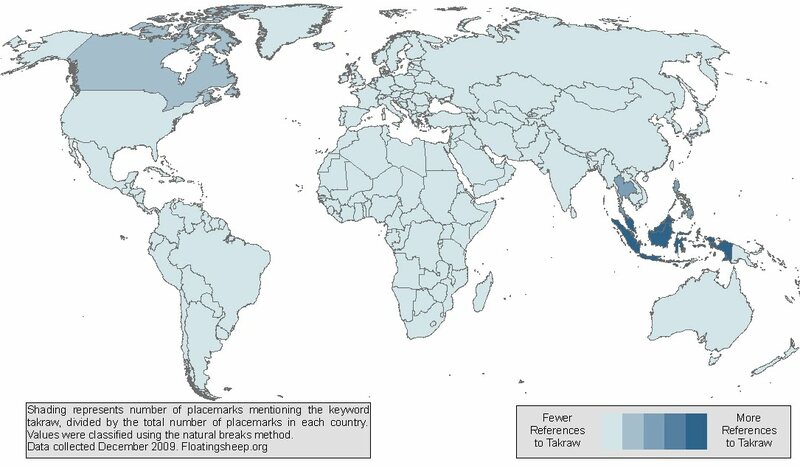 References to Takraw are most visible in Malaysia and Indonesia, with Thailand and the Philippines close behind. Interestingly, the only other place on the planet outside of Southeast Asia that has a significant number of references to the sport is Canada!